Can you explain this being that appeared? Shop for Ruby Lavender Quartz Pendants Pure quartz is enhanced with an occasional molecule of a rare earth element, empowering the crystal with this beautiful, heart chakra healing color. Many have found through their experience in working with this quartz that it activates and heals the heart chakra with strength and unconditional love. 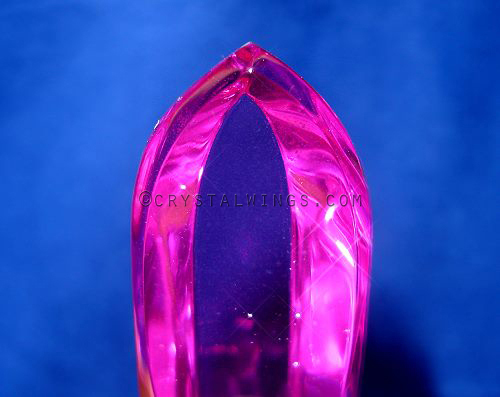 Ruby Lavender Quartz is very close to the color of Rubellite Tourmaline and, like Rubellite, it carries a very commanding feminine force, the female aspect of God at her most powerful. Gentle power and strength, compassion and unconditional love for ourselves and others, and a sense of wholeness are the gifts of an open heart. This amazing stone has been at the center of many miraculous and synchronistic happenings in our storefront, and in our personal lives. The photo at left is not retouched or altered, and is a testament to this stone's mystery and power. These Ruby Lavender tools are exclusively hand cut for Crystal Wings and cannot be found elsewhere. 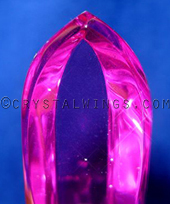 We are very proud to be the world's only distributor of Ruby Lavender Quartz! Want to Learn More About This Unconditional Love Stone?